The BFI continues its tour of Britain on film with this intoxicating anthology of shorts devoted to that most traditional of national institutions: the public house. Roll Out the Barrel – The British Pub on Film is a unique and fascinating collection of 19 films, made between 1944 and 1982. From wartime documentaries, intended to keep up flagging spirits, to independent productions exploring the permissive society of the 1960s, this five-and-a-half-hour collection provides the perfect measure of cultural change in Britain over a 40-year period, from the perspective of the bar and lounge. With many pubs currently fighting for survival, this nationwide pub crawl presents a lasting reminder of the sights, sounds, people and personalities of the great British pub, exploring its unique role as a place of communal gathering, game playing, story-telling, opinion debating, bonding rituals and unbeatable banter for generations. Dozens of pubs, many of which are still in existence, are featured in the films; from London boroughs to Tyneside, Sheffield, Devon, Cornwall, Dorset, Kent, Oxfordshire, Yorkshire, Argyll, Salisbury, Somerset, Surrey, Cleveland and beyond. Amongst the films on offer are Arnold Miller's (London in the Raw, Primitive London) 1969 tour of London's varied club and pub scene, Under the Table You Must Go, the Guinness-sponsored trade film Henry Cleans Up (1974), starring Monty Python's Michael Palin and Terry Jones as rival landlords, Philip Trevelyan's (The Moon and the Sledgehammer) beautifully expressionistic portrait of a Tyneside pub and its patrons, Ship Hotel – Tyne Main (1967), renowned German director Peter Nestler's documentary on leisure time in Steel City, A Working Men's Club in Sheffield (1965), the local quirks and characters of Richard Massingham's (Coughs and Sneezes) wartime trip around England's favourite locals in Down at the Local (1945), and Eric Marquis' (Time out of Mind, Seven Green Bottles) promotional film Guinness For You (1969), which features a soundtrack by British avant-garde composer Tristram Cary. Mastered from film materials preserved in the BFI National Archive (except A Working Men's Club in Sheffield, which was restored by the Deutsche Kinemathek), the films in this collection have remained unseen since the time they were made. 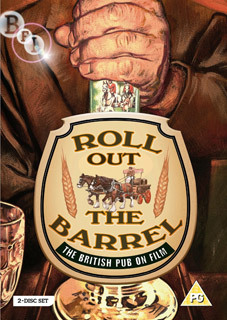 Roll Out the Barrel – The British Pub on Film will be released as a 2-disc DVD set in the UK on 11th June 2012 by the BFI at the RRP of £22.99. The release also contains an extensive illustrated booklet with notes on each film by BFI curators and newly commissioned essays by Robin Turner, co-author of The Search for the Perfect Pub: Looking For the Moon Under Water (Orion) and Chris Murray of the Pub History Society.